Sometimes when I tell people we’ve had 60 butterflies fluttering around our garden at one time, I can sense that they don’t quite believe what I’m saying…but I understand their reluctance. It was seeing one of these amazing monarch spectacles for myself that awoke my burning passion for butterfly gardening. Since starting our Monarch Butterfly Garden less than a decade ago, it hasn’t taken long to achieve serious results. Not only has our garden attracted more monarchs, it’s also attracted lots of other pollinators including swallowtails, red admirals, painted ladies, and honey bees…even hyper-winged hummingbirds! After raising monarchs for over 35 years and butterfly gardening for the past 10, I realized there were some less common gardening ideas that were bringing more monarchs to our back yard than I had ever dreamed…and they could do the same for your butterfly garden! However, the monarch attracting techniques I was using weren’t the same-old general ideas found floating across the interverse. I had learned them from years of first-hand experience with monarchs, and from talking to other butterfly gardeners. 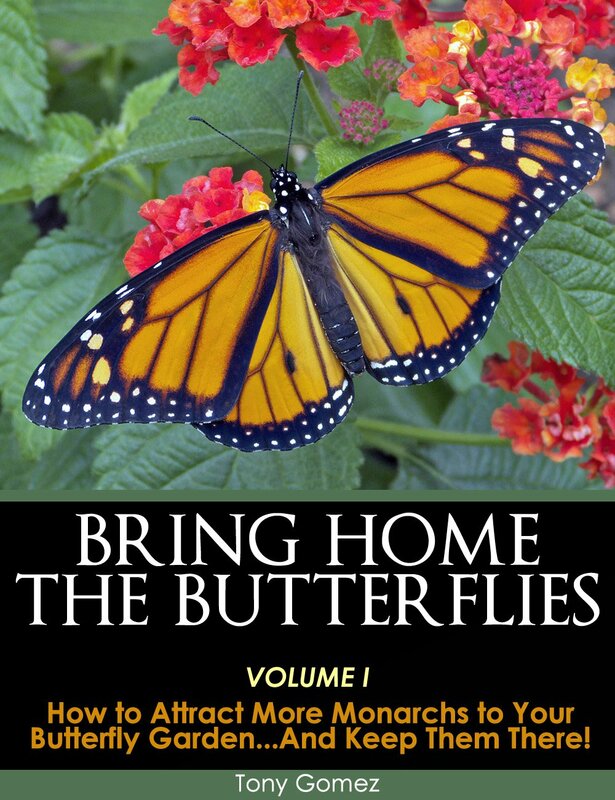 In Bring Home the Butterflies Volume I ( a digital butterfly gardening book), I reveal 8 easy Monarch-attracting tips that you can start implementing in your garden this season. Some are capable of yielding immediate monarchs, while others will take more time to attract these magnificent and inspirational creatures. What if after reading reading this butterfly garden book, you still have questions about butterfly gardening to attract monarchs? You can ask me personally by posting them in the comments section at the bottom of this page. PDF files can be viewed on practically all electronic devices with a PDF reader which most people already have installed on their computers. The most popular free reader is Adobe’s but there are also other free and paid PDF readers if you do a google search. You probably already have the capability to read PDF files on your desktop, laptop, or tablet computers. Click Here to Download Adobe Reader on your device. This informative guide will pay for itself many times over as you save valuable time and money trying to attract monarch butterflies. Start your butterfly garden journey by choosing the book or save $3.00 when you bundle with the how to raise monarchs guide. I recently downloaded your book, vol. 2; but didn’t find an answer as to why I am losing most of my caterpillars. I washed my containers in the fall, lay paper towels in the bottom and place the leaves on twigs. Last year I raised 50 butterflies. This year, I have brought in 19 eggs that hatched and another 15 caterpillars of various lengths and all but one has died. They just quit eating and turn a little dark and shrivel up. I am feeding common milkweed. Help!! Hi Nancy, it could be a virus or bacterial disease. Can you suggest any butterfly plants that don’t attract bees? Hi Donna, almost every butterfly plant will attract some bees…I used to have a fear of bees before i started the garden and i’ve come to see over the years that bees are not aggressive and either are wasps….the exception would be if there is a nest in your yard and they feel threatened. The garden is 10 years old and I’ve never been stung…I didn’t imagine that was possible in a pollinator garden, but it is! I would like to make a very important point about our efforts to increase the number of Monarchs. First, I need to preface my statements with my thoughts about global climate change. I believe we did ourselves a great disservice when we called it Global Warming. Warming is a part of it but as Al Gore mentioned in his Inconvenient Truth movie, what is happening is really dramatic climate change that includes warming! I can’t tell you how many arguments I have been in with people who point to very cold winters back east and how that disproves Global Warming. I think it is important that we speak accurately when we are campaigning for something. Many times I’ve read that we are working to prevent the extinction of monarch butterflies. We are actually working to prevent extinction of the midwestern US Monarch butterfly migration, which we have so much to learn from. Extinction implies every last Monarch would be gone. Most people do not realize that monarchs exist in other parts of the world, such as New Zealand, South Africa, Hawaii, and parts of South America. Monarchs are not in danger of extinction, but we are in danger of losing Monarchs here in the United States. We need to fight for our Monarchs, but we need to be smart about how we voice our concerns! I’m in Southern California and we haven’t really had winter here this year. It’s been in the 80’s lately for weeks at a time. Monarchs keep laying eggs, so I keep bringing some of them in to raise in my cage with cuttings from my tropical milkweed. I released two monarchs about a week ago and currently have four that are in the chrysalis stage. Am I doing the right thing by continuing to do this? 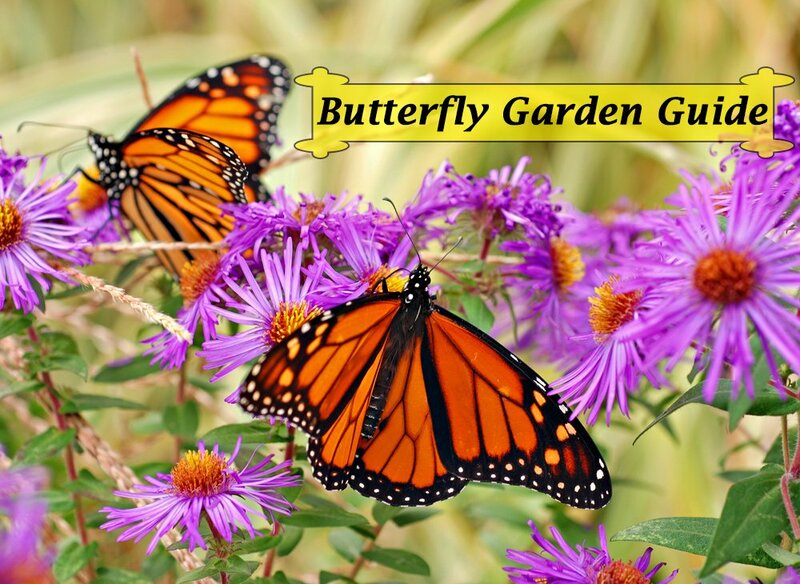 What a wonderful resource for planting a butterfly garden, especially to attract Monarchs. The e-book is so full of tips and information, all in one place so I don’t have to surf the web and get confused in the process. Thanks so much for offering this well thought out and written guide that is not only inspirational but will fuel a new passion for helping this amazing species! Perhaps that is where I saw how to divide milkweed plants? Tonight 9/1/17 we are expecting frost her in the Adirondacks … where the migration generation begins. There are several people raising cats in outdoor cages in protected areas such as screen porch. We have nearly 100 chrysalids and as many cats. What should we be doing to protect our babies until they are ready to fly? Also, should we continue to collect cats after the frost? update: We are finding PLENTY of cats even after the first frost. My question is this: With the flooding from hurricane Harvey in Texas will the monarchs find food & sheltered areas to survive their trip to Mexico? What can I do? I would like to know what I need to do with two of my cats that are at the chrysalis stage that are turning black, so I think that they are about to emerge into Butterflies tomorrow. I will not be home at this time so I was wondering what I need to do? We have 10 chrysalises at the top of our pop up laundry container and two of them are black and a little green not clear yet. I’m afraid that they will emerge and I will not be home to let them outside after they dry. What can I do for them until I get home from work? Hi Mary, you can release them when you get home from work. There’s nothing you need to do. congrats and good luck! I’d like to clarify the generations Monarchs go through. Let’s start in Mexico…the overwintering Monarchs fly north to a food source and lay eggs. Those eggs hatch (1 generation). The resulting b’flys fly north and lay eggs as they go. My reading indicates its a 3-generation migration — lay eggs, hatch, fly, lay eggs hatch fly, layeggshatchfly, and by now we would see them in the Adirondacks. Thus, 4 gen’s so far. Then here in the Adirondacks…the (presumably) 4th gen larv I collect around the 1st of July emerge and fly about a month later in early August (could be earlier) and they lay eggs (gen5) which fly about the 1st of September. Depending on the conditions throughout the summer, these may be the ones that migrate to Mexico, or there may be one more generation. So that would be a total of 6 generations, maybe 7. Hi Daisy, I think there are often more than four generations throughout a season. Those generation charts provide guidelines, but there are often exceptions to the rules. This is my second year gathering and raising cats to butterflies for release. This year they started appearDDing a month earlier than last year. Several times this year I noticed cats feeding on the actual flower buds of the milkweed. That’s just an observation to share. My question: this year I also noticed some of the larger cats “acting aggressive” toward chrysalids already hanging. In one case, the cat knocked the chrys off its button. In other cases I have intervened…the large cats seem quite determined to touch the chrys. But in another case I just observed and it seemed the cat was just “feeling” the chrys, and it appears that cat made its J right next to the chrys. What is your persepective? Are they “aggressive” or is that the way I see it, as a person? Do cats normally do any damage to the chrysalids? Do cats do any damage to other cats? Hi Daisy, if caterpillars are going to the roof of the cage to form their chrysalis, we haven’t had any issues, although sometimes they will end up very close to each other. If they climb to the roof to look for more milkweed or because they are overcrowded, this is when problems can occur, with the extreme being chrysalis munching. I have never had this happen with ours. Fresh milkweed (plants or cuttings) + not overcrowding are key to a happy habitat. I don’t have digital. Is there a hard cover book? You must have some form of digital, so you could ask this question on line. So download and print the downloaded pdf, or ask a friend to do this for you. I live in Malibu, California so our weather is a little warmer but even knowing that milk weed is usually available in the spring/summer- I found 11 caterpillars on what is left of my milk weed and don’t think seeds will be an option. What can I plant now for these guys. They are Monarchs! Western Monarch Resources good luck! I have found Underwood Family Farms in Moorpark, Ca is a good source for pesticide-free milkweed plants. I recommend you call first to be sure they still have some. I am brand new to your website. I am in the process of converting what’s left of my lawn into planted areas that will attract monarch butterflies and bees. I live in southern PA. I need advice on getting rid of grass. Do you think pine needles would make a good mulch? These resources look great from novice butterfly gardener to professional butterfly gardener. But my question is the suggestions, tips and requirements have to change based on zones for gardening the plants that attract the Monarchs and other butterflies etc. I live in Zone 10 and it is a subtropical area which could hinder the growth of some of the plants necessary for successful growth. Do these resources you provide cover this? Hello, how much space do you need to have for a butterfly garden. We do have 1/2 acre but most of it do not full day sun due to really tall pine trees (I live near Seattle, WA). The patch that does gets good sun is rather small, approx 20 x 5 ft. Will this suffice? Hi Usha, a butterfly garden doesn’t always need full sun, and it can be a benefit when your garden has different microclimates that will appeal to butterflies at different points in the season. the size of your garden is fine. If planting a smaller garden, make sure some of the nectar plants are continuous bloomers so your garden is always ready to support butterflies…good luck! Question: Your volume 2 book, Bring Home the Butterflies -does it have volume 1 in it as well, or do I need to buy both? Thanks! Love your sight & all the great info you are sharing. We, the Washington County Master Gardeners, are having a Pollinator Palooza this Saturday, June 11, at the Washington County, MD, Rural Heritage Museum & county extension location. There will be a Discovery Trail, with several stations of learning opportunities for kids & adults. My part is educating children at my certified Monarch Waystation, Children’s Butterfly Learning Garden. I am also demonstrating how to raise monarchs & would love to have your book(s). My husband and I have 13 acres, and would like to designate a portion to Monarchs. We have “hatched” these beauties for our daughter to experience, and now our granddaughters. We started last year with 10 plants, but not the common milkweed we normally see in Ohio. We want to attract them now..does your book tell how to basically “start a farm” for Monarchs? Interestingly enough, my Monarchs will not eat local milkweed. At all! But they really like tropical milkweed and prefer giant milkweed over anything else. So after 6 years or so of experimenting, those are the only ones I will plant this spring. Fresh seeds on a heated seed mat, germinate in about 4 days. 85 degrees. Grow lights for a couple of weeks then into a light tent until time to plant. Have a big bug house to keep the cats in so the ladybugs and wasps do not get them. Aphids and milkweed beetles easily handled with a spray nozzle on a hose. My nozzle can spray UP, very handy. I am in the middle of Missouri, currently 19 degrees. About 60 seeds are up, planted 4 days ago. Not including the overnight water soak at also 85 degrees. No matter what anybody says, the cats eat other greens. I find them all the time in lawn Clover and climbing Clematis. Happy gardening! And in this case, ladybugs are not your friend. But NEVER poison anybody! Or even use soap. Common sense and a good eye will rule the day. Hi Bill, I’m not sure what native varieties you have planted, but monarch caterpillars definitely like native common and swamp milkweed. Sometimes, what gets utilized the most depends on other factors like amount of sun a patch receives. We grow over 15 varieties now, and almost all are used as host plants at various points in the season…each season their preferences are never quite the same. In fact, last season they frequently used are A. tuberosa, which has never happened before. Monarchs caterpillars only eat milkweed. It’s possible you are finding them looking for a place to pupate, or perhaps mistaking another caterpillar for them? Two caterpillars often confused with monarchs are eastern black swallowtails, and grape skeletonizers. Ladybugs do eat eggs and small caterpillars, but they eat far more aphids so I’m happy to host them in the garden. You have the best idea for boosting their survival…putting them in an enclosure. Have a fantastic season! I’ve just purchased “Bring Home the Butterflies, Volume 1” and I see there are many links in the text of the manual. How do I access them from an e-book? Hi Mary, you can only access the resource links if your device has internet access, and then you would just click on them with a stylus or your finger. We just discovered your site through a recommendation from the Minnesota Bee Lady, Marla Spivak. We have a fruit and vegetable farm in Minnesota and have several thousand people pass through our gates each summer. We have planted bee friendly crops in our rotation of crops and our beekeeper has indicated a spike in honey production since we have planted them. Now we want to make our farm a spectacle for Monarchs. We have wanted to make a difference for the Monarchs ever since we took our grandchildren to see “Flight of the Butterfly” at the MN Science Museum. Hi Bill and Nancy, it’s great to hear you are adding monarch-friendly plantings to your Minnesota farm. Like you said, my book is written for the home gardener, but many of the tips and ideas could also be applied to larger projects. Book 2 is about raising monarchs, which might also be interesting to berry pickers coming through your gates…especially ones with kids! I typically plant seeds mid-late October or before our first heavy snow and mid-september to mid-october is a great time for fall planting plants. That would be quite a spectacle to have hundreds of monarchs at your farm entrance, but in a time when there are less monarchs, that would take some work and would require plantings as well as a raising component. Around the migration (late August to Early September) is when you would have the opportunity to attract monarchs in mass. Milkweed and nectar flowers will also attract many other butterflies and pollinators…good luck with your project! How can I keep the milkweeds from taking over our backyard? Don’t they spread rapidly ? Hi Tessy, some varieties are more invasive than others. Common milkweed spreads through underground rhizomes, but you can keep it at bay by planting it in a dedicated section of the garden away from other plants. You can also cut off seed pods and discard before they burst open. I plan on planting milkweeds this summer, but I saw milkweeds also attract aphids, milkweed beetles, and tussock moth. Is there any companion plant that would keep those pests away, but still attract Monarchs, like the marigold flowers, or is there anything else? I was assigned to a country church outside of Oklahoma City in 2011. There were large swaths of wild sunflowers growing all over the property, and one day I looked out and saw Monarch butterflies all over the sunflowers. It was amazing, but I did not appreciate how some people work for that. But then a sad thing happened when they were all cut down even though I did not ask that be done. Someone thought they were unsightly and were doing me a favor. No more monarchs! But I can easily get them to come back by having the lawn mowers give them one section where the sunflowers can grow freely. They are amazingly resilient plants, and now I know the monarchs need help and especially milkweed. Unfortunately I cant get a download of the book , my computer is old and I dont have any of the new gadgets. I do love to see the Monarchs and I would like to know the best place to get some new milkweed , I have the old standby, and it is spreading everywhere. So I would like some of the hybrid variety. Anyone know where they can be bought. Hi Jeanette, I’ve probably seen more hummingbirds in the past few years than in my entire life. Hummingbirds are attracted to almost ALL the same plants, which is a great bonus for creating a monarch garden. I read your book about the monarch butterfly. I am amazed by all that you have learned. Fantastic work, I am going to share it with my class, they are Year 6 to 8. I think they will be very impressed. I live in New Zealand, we have the Monarch butterfly here too, and some develop on a plant on our school grounds. The plant is called the Swan plant. We have a problem here, because a wasp that was introduced into our country, preys on the caterpillar and so Monarchs are endangered by it. My next door neighbours have a monarch nursery where they watch and care for them, and try to keep the wasps from getting them. I learned many interesting facts from your ebook, thank you. Miss Trask, New Zealand PS I love the iPad, and I can see from your work you do too. How much is the book Butterfly Gardening Guide? Tony, just found your website; so informative. Today my husband was cutting back my Annabelle Hydrangea bushes for the winter and came across a gorgeous large Monarch butterfly. It was motionless; however he brought it inside the garage and placed it in a large jar with several leaves. Then this evening he brought it inside the house and a short time later I was working nearby and it started to flutter its wings and worked its way out of the jar and onto my shoulder where it stayed until I gently removed it and put it back in the jar. What else should we do for it? And is it near the end of its life cycle?? Should we take it back outside? Sooo Precious!